Comparative shopping extension for Firefox. Is there a better alternative to Window Shopper for Firefox? Is Window Shopper for Firefox really the best app in Internet Utilities category? Will Window Shopper for Firefox work good on macOS 10.13.4? 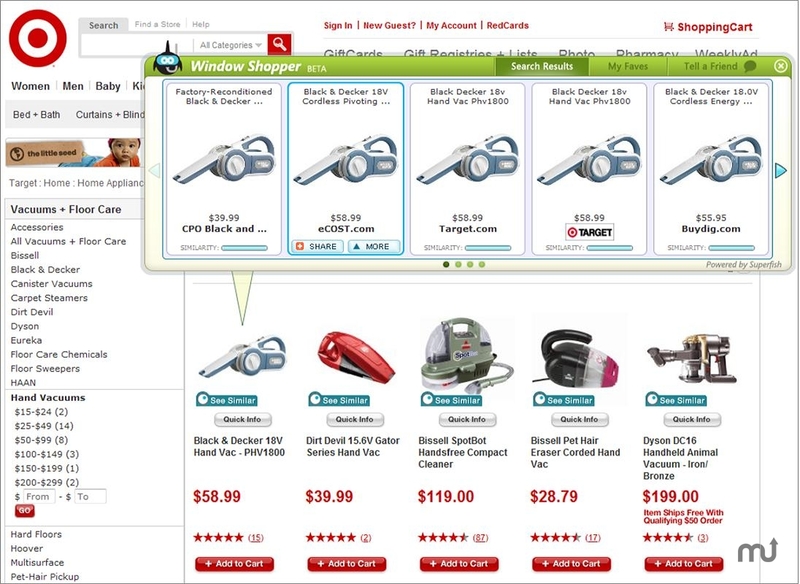 Window Shopper for Firefox... Instantly compare prices on any product on 3,200 U.S. online stores including Amazon.com, eBay, Best Buy, Newegg, Macys, Nordstorm, Overstock.com, Staples, Target, and Wal-mart. Our index covers over 110 million products in practically every product category. If we find a deal, we'll show it. If we can't, we'll show you similar products you may also be interested in. With the Window Shopper Add-on, there's no more jumping around from site to site to compare prices or to find what you want. Window Shopper for Firefox needs a rating. Be the first to rate this app and get the discussion started! After you download and install Window Shopper, you will see a "See Similar" icon appear next to product images on hundreds of shopping websites. Just click on the icon and the Window Shopper window will appear, presenting deals and visually similar products from hundreds of online stores. The first thing you'll see is up to 20 visually similar items, grouped in sets of five images. Scroll to see more. You can refine the results by selecting "Show More" or "Show Less". Of course, you can also click over to the merchant for more information about the product.